Seeing the sign caused me to stop on my ride Saturday afternoon. The numbers of living units designed for old people keep growing for an obvious reason: There are more and more customers for that sort of arrangement and care. In Oregon, the population aged 65 and older jumped — although this may be the wrong word picture — nearly 22 percent from 2000 to 2010, making it the fastest-growing age category in census reports. Ridgeline Management Co., based in West Linn according to its website, plans to build and run a three-story complex at 2853 Salem Ave. S.E. in Albany. The project needs a conditional use permit, and the city planning commission will hold a public hearing at 5:15 p.m. Monday, Feb. 1, at City Hall. With 73,000 square feet of interior space on a 2-acre lot, the building will have 70 units for assisted living and 21 for Alzheimer’s patients. It will have 41 parking spaces for cars plus six for bikes. Albany yellow pages list five assisted-living facilities, including the Mennonite Village and the latest addition, Bonaventure. 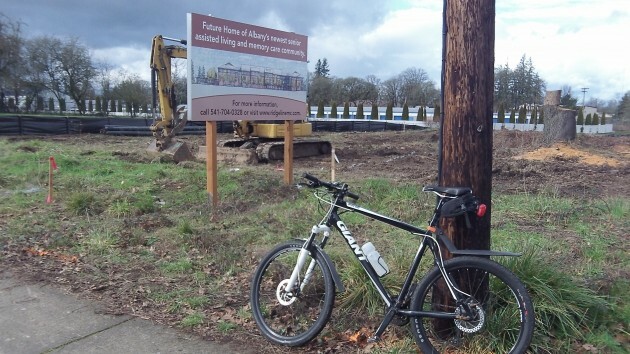 Work on the Salem Avenue site has started, as I could not help but notice as it is on one of my bike routes and I rode past it Saturday after being away for a couple of weeks. $3,200, I do wonder how many people can actually afford to pay $3,200 a month long term..? When their money runs out, then what…? Housing prices are going through the roof. A small Studio in Portland goes for 1300. A 1-bedroom goes for 1500+. This then is about twice such rent. I agree it’s a burden. Alternative housing will have to be developed in the future. We have already started going down the path with ‘shared cars’ catching on fast with the young who not only do not see the need, but are not willing to pay the price of a car that is unused 95-98% of the day. At some point the notion of an apartment, with one’s own bathroom, living room, and kitchen, will also fall by the wayside due to economic needs. A bed will be needed, possibly a large bedroom ‘closet’ of sorts, but shared common areas will be used to reduce costs. Having been through this with my father, what assisted living provided was an apartment, daily meal services in a dining room, laundry and some activities like local shopping, and different levels of care such as medication administration, and personal care – like a menu of services. While cost is out of the realm for a lot of folks, these folks are building this because their projections say that there is a good and steady profit to be made over the next 30 years from aging Baby Boomers, many of whom CAN pay. $3200/ month is likely a close-to-entry rate for someone who can take care of themselves. Price is higher for Adult Foster, and higher yet for hospice or controlled-access dementia (aka Memory Care) facilities. Most places don’t accept MEDICAID at all. A VERY few will tolerate after a year of residence. No, government does not pay, Where do you get that? Prove it.